For the first time since 1933 Tioga Rd, the northern road through Yosemite National Park, has been open this late into January. Due to the complete lack of snow the road has remained clear and the park authorities have left it open for travel. The temperatures in northern Yosemite are right around freezing during the day and much colder at night and all of the Tuolumne Meadows lakes have frozen over to the point where people are ice-skating all over them. 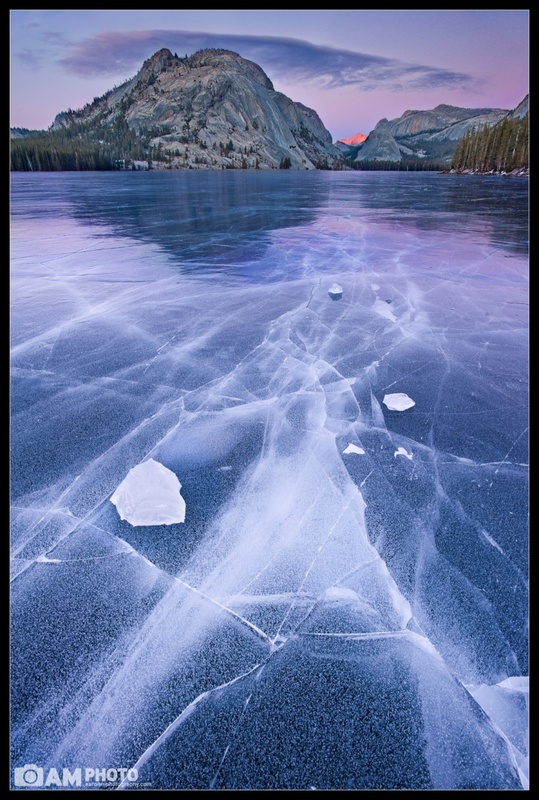 Willie and I decided to take advantage of this once in a generation chance and drove up Sunday morning with the plan of shooting Tenaya Lake at sunset. The weather clouds looked promising and we saw perfectly partially cloudy skies all along the drive to Tenaya. We arrived early enough and spent a while scouting around the lake. At first we walked on the outside edge of the lake but after witnessing multiple people skating all over the lake we decided the frozen lake was thick enough for us to walk on. It turns out it was over a foot thick with ice Plenty to support us.